I’ve fallen behind in my sampling of the Atelier Cologne line. I tried all the original releases (and I liked Trèfle Pur enough to put it on my to-buy list — where it’s languished for years). Just-launched Cédrat Enivrant* is the first brand-new Atelier Cologne fragrance I've tried since Vanille Insensée three years ago. The Atelier colognes I've worn remind me of Jo Malone perfumes: well-blended, non-threatening, mostly “dressy-casual” in style. These type scents smell “good” but rarely inspire me to purchase them. Cédrat Enivrant fits in this category. Cédrat Enivrant (“intoxicating citron”) goes on smelling sharp, robust and natural; the air where the cologne is sprayed smells like I've sliced into a Buddha’s hand citrus or etrog citrus. There is a green tinge to the proceedings: hints of lime and mint. Cédrat Enivrant's tangy herbal aroma is a bit “weedy” and bitter. As Cédrat Enivrant develops (and it lasts a long time for a citrus perfume...over six hours), the mint and citrus are joined by a light and dry vanilla aroma. There's not one thing to dislike about Cédrat Enivrant...but it doesn't thrill or offer anything new in the "citrus cologne" realm. I've yet to find an effervescent citrus perfume to match my beloved Guerlain Eau de Cologne Impériale; though it lasts only five minutes on skin, I'll stick with that for a fresh blast of citrus that is intoxicating. However, I've not written off Cédrat Enivrant entirely; I plan on buying a bar or two of the soap (Atelier Cologne soaps are heavily scented with luxurious lather). 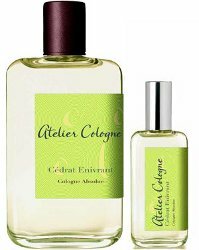 Atelier Cologne Cédrat Enivrant is available in "Cologne Absolue" (15% concentration) strength: 200 ml ($170), 100 ml ($105) and 30 ml ($65). * Developed by perfumer Ralf Schwieger; listed notes include cédrat, lime, bergamot, mint, basil, juniper berry, tonka bean, vetiver and elemi. I really like Cedrat Enivrant and got the bottle too! Orange Sanguine didn’t work for me (a bit nauseating) while this new offering might be similar in style (I mean you smell the whole citrus) it smells better on my skin. It will power me up when it gets hot out there. Yes…it will be perfect in hot weather…did you get the tiny bottle? One you need to sample is their Sous le Tout de Paris. Butting in to say that I love that one (and so did Jessica, I think she bought it after she reviewed it)…but doubt Kevin would! I know it’s unisex, but to me it is the most feminine scent they’ve done. A man could wear it, but don’t think Kevin would. R, well i will try it just for that then…and the Patchouli you recommended too…heavy on the grapefruit, right? To me, the Patchouli is mostly a grapefruit, with a little bit of clean patch. But don’t know if others saw it that way! Flannery…it is on the list! I’m wearing Grand Neroli today, which is just divine for my windowless cubicle: sunny but not beachy, just a breath of warm air from some lovelier world. I also really like Rose Anonyme, but none of the other ACs have really made me fall in love. I’ll probably spritz this one day when it gets to my Sephora, but I’m not seeking it out. Melissa, I wish they were easier to sample…don’t think anyone in Seattle has the whole line…but should check…. Kevin, Essenza in Fremont has so many of them, although I am not sure if this is the whole line. Kevin, I’m with you on Atelier and Jo Malone. Fine but sort of boring. I got an Atelier sample set last year, and none of them lead me to a “Wow!” although a few might be good for a really humid day when everything else seems to be too much. Sounds like this is another to add to that list! MR…wish I had one on today! Drenched myself by mistake in one of the new Parfums de Marley scents…and it is a dead ringer for Drakkar Noir!!! HELP! Oh, so sorry! Are you sharing the joy with others or cloistered away where you can enjoy the full experience without unnecessary distraction? I am ‘perfuming’ an entire floor at work…and I have class tonight. The perfume has been on for 9’hours and it is as strong as ever. I wish they sold the travel sprays individually — I’ve only ever seen them in sets. They’d be perfect to carry around for a little pick-me-up, especially in the summer. Sephora online has Vanille Insensee and Orange Sanguine in the travel size individually – wonder why only those 2? All the rest are in the sets. When I tried the line upon initial release, I thought they were fairly derivative of other scents. One smelled like Bvlgari with its tea note while another reminded me of Varvatos Artisan – though it took me a while to come to that conclusion. Just found them uninspiring, to the point I’ve never been inclined to try any of the more recent releases. Few Jo Malone’s grab me. I just don’t have a ‘pleasure’ response to them. Several of the Ateliers I do like very much and have used small decants. Small decants, however, seemed enough to satisfy my requirements, as after a number of wearings they began to smell too plain. The initial ‘kick’ seemed to wear off. I still have to try the last three or four releases though. I’m excited to try this. I think the line is generally good fun, and I love the small bottles and soap. I have samples of the original 6 scents, and I own a 30ml of Vanille Insensee. I have a 30 of the Trefle Pur that will be up in the next swap (thought husband wanted a bottle, he didn’t). I actually just placed an order for their sample set ($20 for 14 samples, 8 of which I’ve never smelled? And free shipping? yes please!). Y’all, this is my first time ever ordering samples for myself. Kind of exciting. Gee, the Malone’s don’t do a thing for me. However, I really like this line. Taking your clothing metaphor, they tend to be like really, really good sports wear, the items that just always seem just right when you are wearing them. They are also, my favorites for office wear, something that make me feel good and elegant, but not something that will make a “statement” to others which I may not intend. The Vanille incense really is more like the interior of a vanilla bean and not in the least dairyish, a take on vanilla which I love. The Treffle does smell like clovers and grass, a perfect non-floral green. Dilana…they ARE great for the office, or a plane or theatre…. This sounds like something I would love – I like Ateliers and Jo Malones, and citron, lime, and mint are right up my alley. Weedy and bitter, maybe not. I’ll have to check our Sephora. Neiman Marcus used to carry them, but don’t anymore. Just ordered my sample of this one. I like the sound of the notes and might be just up my alley. Also ordered Silver Iris and Gold Leather. Each sample is only €2 each and free shipping! Their customer service and delivery is first rate! Agreed with everyone else’s comments re, sous le toit, definitely the best they have done and absolutely gorgeous. I bought a FB of this for my wife. Your review made me pull out my Vanilla Insensee sample and wear it today. It’s doing nothing for me. I’m indifferent to it at the moment. I’m not a big fan of Rose Anonyme either. It smells like bathroom cleaner to me. This citrus one isn’t something I’m drawn to. I like a few citrus scents but it’s not a note I seek out. I really love this one and Orange Sanguine – have bottles of both. They’re both super cheerful and I love that the concentration is stronger so I can have everything that I love in a (variation on the traditional citrus) cologne plus excellent lasting power so it will wear all day. Hermes Mandarine Ambree is great in that regard too – also wear that and it lasts all day on me. Adore the passionfruit note in it! I just got a 30 mL bottle of this at Aedes! I love how refreshing it is. I get along very well with this line. Yes, almost all the colognes are not complex…my life is complex enough that the simple balances things out. Besides Silver Iris, my other favorite is Sous le toit de Paris which was the ONLY perfume I brought on my summer vacation last year — it was perfect while out and about in the hot Mediterranean weather and versatile enough for evening events in air-conditioned venues. Irony of ironies, I wore it everyday while on vacation except for my day trip to Paris. I’m probably going to end up splitting the giant bottle of this at the next NST splitmeet!